Lead guitarist Daryl Hardy, the “George Lad” of the BeatLads, is one of those time-less individuals that seems always to be at the right place at the right time (at least speaking musically). He’s apparently more venerable that his apparent mid-30s appearance would indicate. He’s rumored to have been present when Misters Beauchamp and Rickenbacker experienced the spark of creativity that resulted in the first electric guitar. It’s told that he was seen frequently around the Orchard Lane, East Moseley area of London (Abbey Road) from time to time in the mid- to -late ’60s, especially when a particularly moving lead guitar solo was required. It’s intimated in certain circles that he’s filled in for the likes of certain Misters Clapton, Townshend, Santana, etc. (Albert Hall, Woodstock, & other assorted venues). 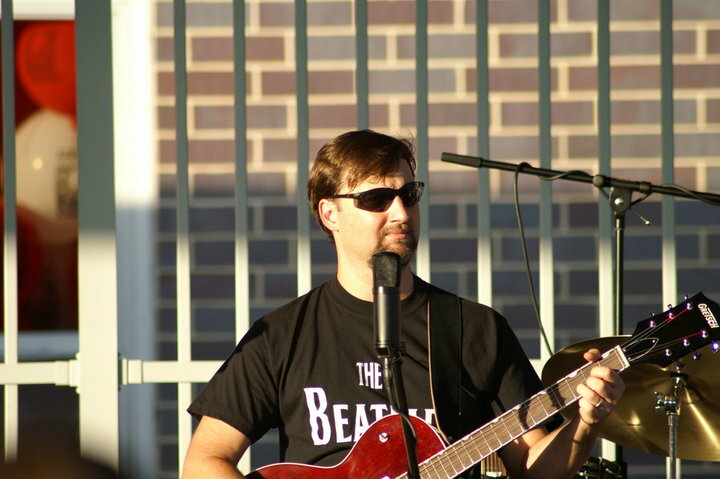 Whatever may be the truth of such rumors, sayings, and intimations, it is certainly the case that the BeatLads are wonderfully blessed to have a skilled, talented lead guitarist “GeorgeLad” like Daryl.